Recently, Wauna Credit Union celebrated a successful staff fundraiser with the presentation of a giant check. 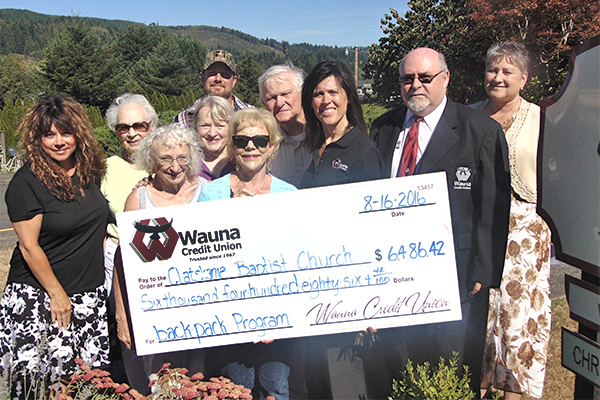 The check for $6486.42 was presented to the Clatskanie Baptist Church for the Backpack Program they organized at several local schools. While every organization Wauna Credit Union staff votes to fund-raise for does amazing work, the Backpack Program was especially close to many of our hearts. The Backpack Program helps fight childhood hunger in America by supplying children in need with a backpack of prepared, or easy to prepare food, to sustain them over the weekend. Many children in America must rely on free school lunch and breakfast programs in order to eat on a daily basis, so this can make for a long and painful weekend if they live in a home without enough food. It is terribly sad to think about and abhorrent in a nation such as America. 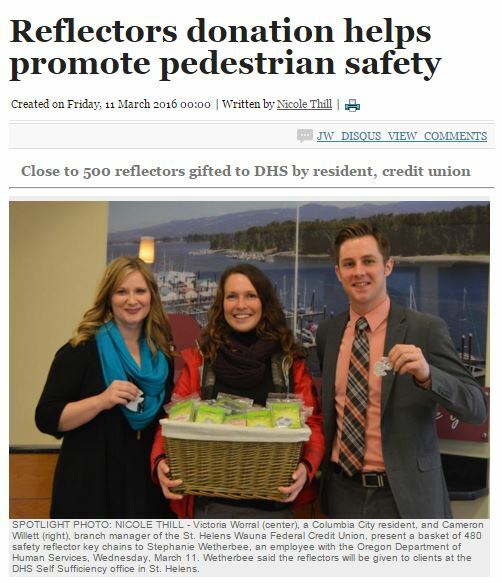 Wauna Credit Union’s Jenifer Katon nominated the cause. She found out about the program and the great work they were doing, and was disheartened to learn there was a waiting list for kids. The waiting list meant that all the children in need would line up on Fridays and organizers would hand out as many bags as they could, this left many children walking away empty handed! Jenifer decided the Backpack Program needed to benefit from our fundraising immediately, so instead of the money accruing in an account, she gave it out as it came in. Almost immediately, all children were off the waiting list so no one had to go home empty handed. Then, the program was able to expand to another school and another. In total, the program was able to serve 5 local schools, and give out thousands of meals to children through the last school year, and even into the upcoming one! It was a huge boost for all of us on the Wauna Credit Union staff to hear how the program was growing and serving more and more children in Clatskanie and St Helens each month. Of course our staff benefitted too through the many raffles that offered cash, sports tickets, and even a beach weekend getaway with the beach house donated for the cause by the amazing folks at Paulson Printing. There was an auction, payroll deductions, “Jeans Days”, and plenty of in branch candy sales, which helped everyone’s sweet tooth, members and staff alike. Oftentimes members will buy a chocolate bar or a lollipop as a quick snack or in support of “the cause”, but without understanding what that cause even is or where that money is really going. Everyone who gave into the craving for a chocolate pretzel or other treat should be proud of themselves that the pretzel they munched on helped a hungry child to eat on the weekend. Thanks to all who support our staff fundraisers, they do so much more than you realize. If you want to volunteer or donate money to the Backpack Program, please contact The Clatskanie Baptist Church.